Where are Amish babies born? Amish families have on average 6-9 children (depending on the community). The question of where to bear them is an important one. Some Amish prefer having children at home, or in special birthing centers. 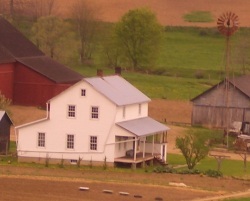 Amish often prefer the at-home setting to the clinical environment of a hospital. Traditional Amish groups tend to favor home births over hospital births. In An Amish Paradox, Hurst and McConnell cite a survey of an Ohio community which showed that 59% of Old Order and New Order Amish births took place in hospital (as compared to 84% of non-Amish births), while less than a fifth of Swartzentruber Amish births did. Amish appreciate midwives and doctors who understand Amish culture. The home setting is less stressful than that of a hospital. Some Amish appreciate the chance to welcome new life into the world in the security of home. Since Amish have large families, cost is also an issue. As Amish do not carry commercial insurance, it is of even greater concern. Home birth can greatly reduce the cost of delivering a child. Midwives and birthing centers generally operate for much less than the cost of delivering a child in hospital. Midwives who assist in Amish births may be Amish or from outside the community. Midwives may offer pre-natal care for an expectant mother. A baby may be born in the midwife’s home, which will be equipped to assure the mother care and comfort. Amish have built birthing centers in Amish communities as well, such as the Mount Eaton Care Center in the Holmes/Wayne county settlement in Ohio, which is staffed by doctors and trained midwives. Others of varying standards are found throughout this settlement. Amish who patronize them also appreciate their proximity, as opposed to hospitals which can be located relatively far away. Home delivery has been controversial in some instances. Hurst and McConnell note that some medical professionals criticize the varying levels of care found among Amish-patronized birthing and midwifery centers. Controversy has also centered around the licensing of midwives. Cases in Pennsylvania and Ohio have been brought against midwives for practicing without a license and for illegally administering prescription drugs. Amish have come out in support of midwives under prosecution, as happened in 2007 in a controversial case in Pennsylvania. The use of midwives and birthing centers varies among Amish, with more conservative groups generally favoring the practice. Hurst and McConell note that an Amish couple’s decision of where to have children depends on a number of factors, including cost, beliefs, and proximity. Amish Online Encyclopedia: Do Amish visit doctors? 5 responses to Where are Amish babies born? Another great book about Amish births is Dr. Frau. I would include in that list the number of children and the ages of the eldest children whom are in the home. Many couples will have their first several children at home (home birth), but in the consideration of having a quiet homefront, many begin to consider a birth center. I was curious if you found the information you were searching for and if you had any additional information? I would love to visit an Amish community and possibly attend a live birth. I was wondering if you had any suggestions for me that could assist me in meeting my goals…. “Home delivery has been controversial in some instances. Hurst and McConnell note that some medical professionals criticize the varying levels of care found among Amish-patronized birthing and midwifery centers.” There’s no surprise here. Doctors tend to think the only right way is their way. Speaking as a Registered Nurse with 20 years of labor and delivery experience I can tell you there are doctors out there I wouldn’t let touch my dog. The midwives I have worked with were far more compassionate and provided a much better birthing experience. There are pros and cons to each way. Leave a reply to Where are Amish babies born?